idea she would also end up caring for 11 puppies! front leg which may have been caused by a gunshot. infected tissue, her veterinarian was confident it could be saved. up to Sheba being in heat and experiencing a false pregnancy. However, her belly continued to expand. with Feed the Furbabies to cover the costs of Sheba’s care. 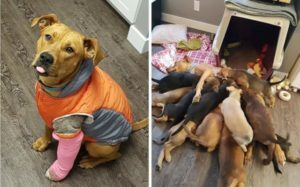 What vet visits look like with 11 babies!